Ruff House Dog Training & Behavior Modification exists to educate dog owners about how to effectively communicate with and train their dogs. 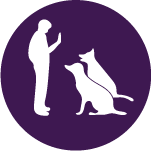 We teach basic and advanced dog obedience to help dog owners eliminate problem behaviors like pulling on leash, jumping up on people, peeing in the house, mouthing/biting, crying when left alone, not responding when called, digging, or aggression towards other dogs and people, just to name a few. We perform our training in private, one-on-one sessions or in group, class settings for puppies and adult dogs. Ruff House views dog training as an adaptive process. It is upon this foundation that our training philosophy and methods are built. 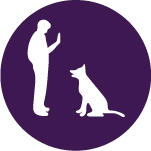 As a result, our training revolves around the concept of using “The Right Tool for the Job.” This means that a specific training method or tool may not be the solution for the same behavioral issue in a different dog and situation. How does this benefit you? 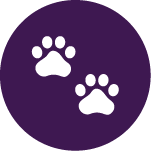 When working with you and your dog, Crystal will apply her natural behavioral assessment abilities together with her years of training experience and choose training methods and tools to fit the specific training needs of you and your dog.